That’s a seductively neat explanation of the man’s politics, but it’s simply not accurate. It’s likely that the Economist (as is typical for the magazine, the byline consists of cryptic pseudonyms) is merely rehashing standard Canadian received wisdom—which long has had it that Harper, like predecessors Preston Manning and Stockwell Day and many Tory MPs, is a blinkered evangelical. In the United States, about a third of the population is evangelical Christian. But in Canada, the figure is much lower. Among Canadian liberals, the e-word has become code for “extreme,” or “fundamentalist.” But that’s inaccurate, too. Evangelicalism as we know it in North America is a relatively recent concept. The word itself has its origins in the Greek for “gospel” or “good news.” It was first used to denote a particular brand of Christians by the Protestant reformers of the sixteenth century—people seen as representing the intellectual elite of northern Europe, and who often were committed to social justice (though that term did not exist then) and even revolution. Two centuries later, the term evangelical was being used to describe those who desired a stricter form of faith—a definition that is closer to the way journalists use the term today. But, even so, many of the opponents of slavery and child labour were evangelical. It was only in twentieth-century United States that the word began to take on a politically conservative connotation. Evangelical beliefs generally revolve around commitment to salvation by faith alone, belief in the Bible as the sole source of authority, and moral conservatism. The evangelical umbrella includes Baptism, Pentecostalism, a wing of Anglicanism, and many in the Reformed community. Preston Manning—being a member of the Christian and Missionary Alliance, a respected denomination with a Baptist-leaning theology—clearly self-identifies as an evangelical. Stockwell Day adheres to Pentecostalism, arguably the rawest and most austere variant of mainstream Protestantism. In many Pentecostal churches, members regard speaking in tongues as a sign of genuine faith, and relentlessly embrace the End Times narrative contained in the Book of Revelation. (In other words, the prospect of Armageddon is as real to many Pentecostals as next weekend’s summer barbecue.) Pentecostals also have emerged as some of America’s most ardent Israel supporters, in part because they believe that Israel’s modern existence (and the Jews’ eventual annihilation) lies at the heart of Biblical prophecy. The evidence suggests otherwise. Some have claimed that Harper is a member of the Christian and Missionary Alliance. But there is no real proof of that: No one has ever claimed to see him attend services at Ottawa’s Christian and Missionary church. * And many of his policies are entirely antithetical to evangelical dogma. Where Israel is concerned, on the other hand, there is no doubt that Harper sings from the same hymnbook as evangelical Zionists. 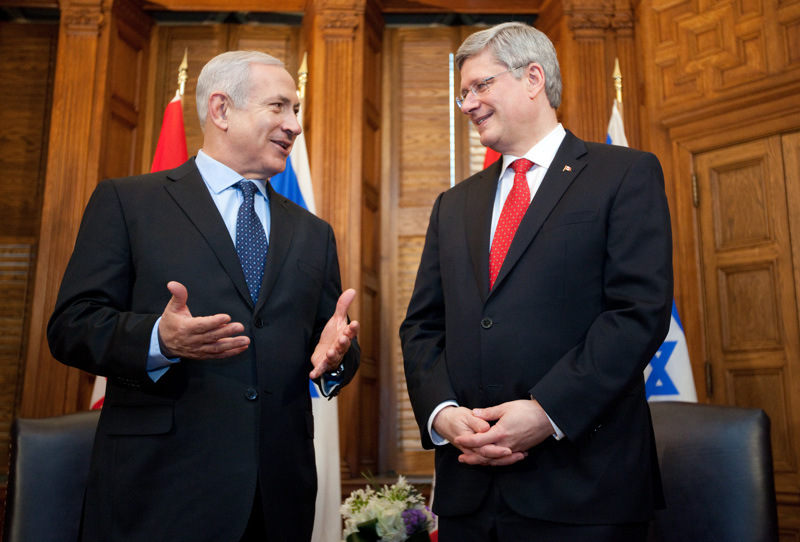 But the connection between his Christianity and his Zionism is weak: Harper’s hawkishness always has been matched by that of former foreign minister John Baird, who no one would describe as an evangelical, and Jason Kenney, a well-known and devout Roman Catholic. We can regard Harper’s support for one player in the Middle East as lacking in nuance without attributing religious motives to his polices. Part of this is, to borrow a term from the progressive left, the resentment of “the other.” Few Canadian journalists are familiar with evangelicals (or, indeed, any form of Christian typology). Being well aware of evangelicals’ extensive influence in Washington, these writers leap to the assumption that the same insidious (to their mind) phenomenon is unfolding in Canadian politics. Equally, some Canadian evangelicals actually perpetuate this belief. Being a somewhat isolated and impotent group within Canada’s largely moderate Christian landscape, they relish the fantasy that the most powerful man in Canada is one of their own. What does Harper believe about God and the afterlife? I honestly could not say: As noted above, his religious beliefs are guarded and largely mysterious. But then he’s a guarded and largely mysterious man. He may say God bless Canada, he may play the Christian card in an understated way now and again, and he may permit some of his MPs (such as Wai Young of Vancouver South) to drop Jesus references when speaking to niche audiences. But the fact remains that he and his most senior cabinet colleagues have spent more time and energy raising support among Muslim, Jewish, Hindu, and Sikh communities than among Christian ones. The construct of Harper as a robotic evangelical is reductive and even anti-intellectual. The link between religion and politics simply isn’t that easy to define in Canada. Which, I believe, very much counts as a good thing. *Since publication, the author has received an email from a reader who claims to have seen Stephen Harper attend church in Ottawa.